"He takes what he wants, without conscience or care for consequences. And now, from beyond the grave, the man he murdered demands he repent. But for Don Giovanni, there can be no redemption. He lives for lust and seduction. And today he must go to Hell for them. 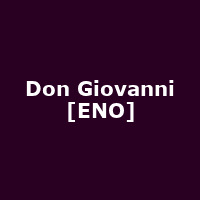 Don Giovanni is an exhilarating retelling of the Don Juan legend. Combining comedy and tragedy, it follows Giovanni's final 24 hours as he lusts his way towards his dramatic demise. Filled with Mozart's glorious music, it includes the famous 'Catalogue' aria detailing Giovanni's long list of lovers."